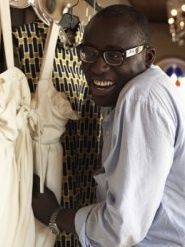 W magazine's Fashion Director Edward Enninful and I have something in common. Yes we both have a love of fashion but this Fashion Week season one of Edward essentials is the iPad. Here's what he had to say about carry it this season. This will be may first show season with an iPad. I’m still getting used to using it. Fashion people can be so funny, I have a feeling lots of people will be at the shows this season ‘with iPad’!